Welcome to The Caprese Restaurant Glasgow’s Blog! DON COSTANZO IS NOW OPEN! YOU CAN FIND US AT 13 WOODSIDE CRESCENT, GLASGOW G3 7UL TELEPHONE NO 0141 332 3070. NEW WEBSITE WILL BE UP AND RUNNING SOON! OPEN MONDAY TO SATURDAY LUNCH 12-3PM AND DINNER 5-10PM. BOOKINGS NOW BEING TAKEN FOR CHRISTMAS! Sadly we have now closed our doors for the final time but, all is not lost! We will be re-opening later on in the year in our new location at 13 Woodside Crescent, Park District, Glasgow G3 7UL! Opening day to be announced nearer the time so please subscribe to the blog and you will be automatically updated on any news from us! (PLEASE NOTE: IF YOU WISH TO READ OUR LATEST POSTINGS ON THE BLOG, PLEASE PRESS BLOG POSTS ON THE TAB MENU ABOVE THIS PAGE). You may have stumbled onto this page whilst searching for the best Italian restaurants in Glasgow, the best family run restaurants, great Italian food in Glasgow or perhaps you already know of us and are looking for all the latest news, menus and wine lists that we can offer. Whichever way you may have found us, welcome home. For those who do not know of us already, we are a small, intimate and friendly little Italian restaurant located on 217 Buchanan Street in Glasgow (directly opposite Buchanan Galleries). The Caprese is owned by Costanzo Cacace (shown above) who is your chef, your entertainment and your host 6 days a week (closed on Sundays). Costanzo has a great team behind him, most of them happen to be his family and they help to give the Caprese Restaurant its unique ambiance and friendly atmosphere. 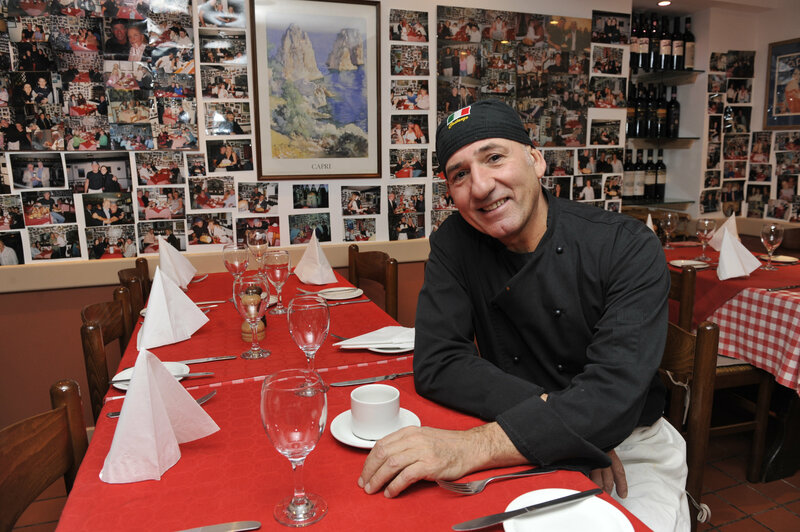 Costanzo has owned the Caprese for 26 years, opening his doors when Buchanan Street was not the street it now is. When he opened, Buchanan Galleries and The Royal Concert Hall were non-existent and the street was lined with old tenement buildings. Things started to change and building work started all around him completely changing the face of Buchanan Street for the better. In those years, Costanzo built up a loyal clientele who came to enjoy something different from what was offered elsewhere. The Caprese gained a reputation for excellent food, great atmosphere and some may say, unique decor! We still see those customers who were with us right at the beginning and they have not only remained customers but become friends to us. The recipe for our success? A large helping of Costanzo, generous portions of his family, sprinkled with lavish helpings of our amazing customers and sealed with love. The perfect recipe. Things are changing though. You may know already that Costanzo has sold the restaurant and will be moving on. Buchanan Street will no longer be our home and will instead house another huge shopping complex sadly. We will close our doors for the final time on the evening of Saturday 26th February 2011. This will be preceded by a month-long celebration of The Caprese as we want to make this a special time for all of us. Costanzo does have an ace up his sleeve though in the form of another restaurant situated on 13 Woodside Crescent (formerly Nick Nairns) near the Park Circus area of Glasgow. Work will begin on this restaurant early next year with a date for opening to be announced. In the meantime, we will be updating the blog on a regular basis with general news, photographs, updates on the new restaurant etc. Please feel free to look around the blog, navigate your way around the various blog posts on a variety of subjects such as delicious dishes, mushroom picking and our customer photos of course. Comments are always welcome but not of the spam kind, we don’t like those but send us your messages, what you think of the blog, whatever you want to say, we welcome your input. Navigation tabs can be found at the top of the page. All posts can be found under the Blog Posts tab. Happy reading everyone! HI FROM NEW YORK. MERRY CHRISTMAS TO ALL. GOOD LUCK WITH YOUR NEW RESTAURANT COMING NEXT YEAR HOPE ALL IS WELL HUGS TO MIRIAM! WISH WE COULD DINE AT YOUR PLACE I’M SURE IT WOULD BE A WONDERFUL EXPERIENCE! I DREAM OF EATING YOUR MUSHROOMS THAT YOU COLLECT WITH LOVE! Had a wonderful night. Food great as usual. Looking forward to next saturday will be a very emotional night. But we only have to wait till August for the new restaurant to open with the same awesome food ‘!!!!!!!!!!! Tante belle cose, Costanzo!! !, questo augurio ti arriva dalla Florida, siamo amici con i tuoi migliori clienti (gli Seddons) che hanno sempre parlato benissimo del tuo ristorante, di come si sono divertiti tutti questi anni e delle buonissime pietanze preparate da te. Thank you so much for your kind message! Mr and Mrs Sneddon have spoken about you and Costanzo is most pleased that he has more transatlantic fans! Costanzo likes your idea of a national holiday on the day we close! Thanks again for taking the time to wish us well! Susie Paul Carol and I had another wonderful night on Saturday. Susie loved getting her Caprese style birthday cake. Nice picture of Constanzo and Susie! We would like to wish you Good Luck for your new venture and we will be there like all your other loyal customers! You will be missed in the city centre. Its like a prty every night. Nobody does it better than Constanzo and his girls! Thanks so much Glen! Glad Susie enjoyed her special cake, thankfully we had time to do it in amongst all the madness that was going on! We will miss the city centre in a way but we are looking forward to being in a nice, quiet area away from all the noise of the city and at least there is somewhere to park up there! Keep in touch and keep watching the blog as I will keep it updated with all the news of what is happening and when we are opening. See you all soon! I’m looking forward to the new restaurant, Caprese really is truly authentic Italian cooking. All the best to Constanzo and all the family with what I know will be a fabulous new venture. Thank you Aileen. Best wishes to you too and hope we see you whenever we finally open up! Looking forward to your opening in Woodside Crescent,]. Please let us know when you are opening. a good summer in Capri. From all your friends in Stenhousemuir. Thank you Anne and John! We had a fantastic summer in Capri, over too soon though! Of course we will let you know when we are opening, hopefully it will be soon! Will you hurry up and open,I am having to put up wi wifes cooking lol,good luck. ROFLOL! We’re telling your wife you said that! We’ll try and hurry up just for you then! Mr Oliver and Mr McInnes would like to sample your food again. Where, when and how? Mr Oliver, Costanzo says it’s nice to hear from you! He’s still working hard, more than ever and trying to have the new place open for end of October, licence permitting. Lovely to hear from you and Costanzo sends his best to Mr McInnes too. The new place will not be called Caprese but instead is called Don Costanzo, Costanzo says you must remember to kiss his hand when you come in as a sign of respect LOL! We are still on the old telephone number 0141 332 3070 and the new address is 13 Woodside Crescent, Glasgow G3 7UL. If you subscribe to the blog then you will get email notifications when we have posted anything new, like when we are opening so remember to subscribe! Take care and we will see you both soon. Here’s wishing you the very best for a gentle and productive start tomorrow in your new Woodside Place venue. In amongst all the hustle and bustle I think you better take time to designate a new table for Len Murray – we’ll be in soon. Good luck to Costanzo, Jo and Ilia and all your great staff. Hope all has gone well. Christine Morrison and I will be in to see you in the New Year. Hi all – planning our 2012 holiday in Scotland and looking forward to eating at Don Costanzo’s!Wondering what the open/close days and hours are for the new restaurant. Can you email me that information? Thanks much – hope all is well with everyone.